A literary wedding reception is both personal and unusual – because, curiously enough, brides the world over haven’t made it a huge trend. This is good news for all the book-loving couples who are looking to have an individual reception that’s also unique. If that’s you, then read on. In terms of popularity, Alice in Wonderland has to be the most popular theme of all books – but it’s not always done with a book twist. Harry Potter has also made quite a few appearances over the last few years, and it’s no wonder because it lends itself perfectly to a celebration, what with the Great Hall and its stunning candle-lit majesty for perfect inspiration. But these are just two books out of millions – the possibilities really are endless. Think back to your childhood and your beloved stories… Beatrix Potter, Dr Seuss, Charlotte’s Web, Pippi Longstocking… even The Very Hungry Caterpillar. And these are just bestsellers! You may think this idea is a bit out there, but if you’re all about no-holds-barred romance, you could even have a Mills & Boon reception! There really are no limits – as a book lover, you have an unlimited number of ideas at your disposal. 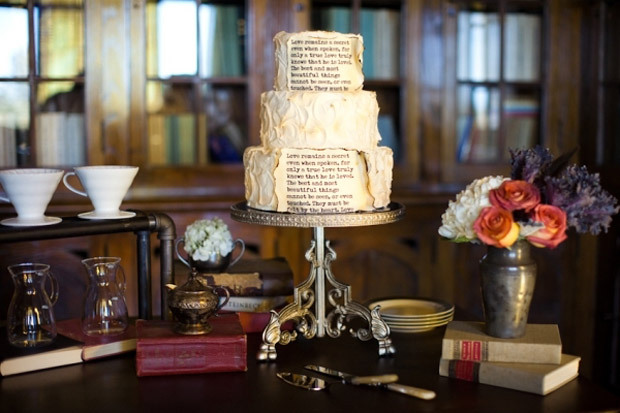 Here are our five favourite ideas for an unforgettable book-themed wedding reception. Alice is perfect for those who like to add a touch of the extraordinary to even the most mundane things. 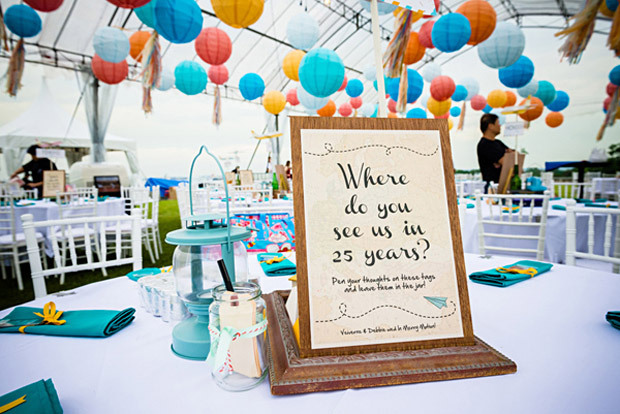 You may have noticed that Alice-themed weddings often focus on just one thing – like the tea party for example, or the general kooky theme of striped stockings, colourfully unusual decorations, and ‘eat me, drink me’ favours. How about doing it a little differently? We suggest you take a look at the original Alice illustrations by John Tenniel – you may even remember them from your childhood. With so many adaptations of the story – by Disney and Tim Burton among others – it’s easy to forget how absolutely stunning those original drawings are. That’s your whole theme right there – you can use your favourite ones on all your stationery, on your favour labels, or go all out and have paper or linen napkins pre-printed with the images – it costs less than you think. You can keep your wedding reception classic white, with these illustrations in colour to truly stand out – or choose your favourite colour and keep the illustrations black and white. The world of Alice was so colourful, you can literally use anything at all, and it will be stunning. Not just for kids, oh no – comics are beloved by adults too, and still published today in their thousands. We all had our favourite one, and it’s even possible your other half may still have a stack of them hidden somewhere in the attic. What a perfect wedding theme! Again, the artwork is key to your entire look. There are fantastic ways to personalise this – put fun messages or questions in the ‘speech bubbles’, create unique trivia, and if you can’t agree on which comic to use… it’s okay, just use all of them! This is one of the few exceptions where you can’t really have ‘too much’ of anything, and it won’t look overwhelming in the least if you have a different character at every table. And the choices? Endless. Marvel alone has produced so many beloved stories – The Avengers, Captain America, X Men et al – and you’ll have loads of others to choose from. Go as cheesy as you like with Sailor Moon’s manga theme, or full-on superhero with Batman, Superman, Spiderman, The Hulk… If you want to go really bespoke, draft in talented members of your family or wedding party to create bespoke pictures – then have them replicated by a professional printer without breaking the bank. Among the thousands of childhood stories, this one is known by virtually everyone – and we don’t just mean your closest family and friends. According to various sources on the internet, these books have been translated into at least 50 languages, and that includes Esperanto and Latin! So even if you have foreign guests at your wedding, chances are they’re not going to react with surprise when they see pictures of a certain bear. The beauty of Winnie lies in the characters – there are so many personalities, virtually everyone has something in common with one of them – whether they’re the bouncy Tigger or the precious Piglet. This classic tale shares the same image fate with Alice in Wonderland, having been re-imagined and updated many times, departing from the classic illustrations by E H Shepard. Again, it’s the classic pictures that really tug at the heartstrings, with so much care taken to develop the personalities through simple pencil strokes. There’s another way to approach this idea – it marries very well with a rustic, country or autumn theme, where you can have your field flowers, hessian, and old-fashioned pies complemented with a few choice touches of classic Pooh images. You could even add small figurines to your dessert table, and don’t forget colouring books for the kiddies as well. Overall, it’s a very flexible idea you can run with as far as you like – you’re guaranteed to get ‘awwww’ from many of your lucky guests. 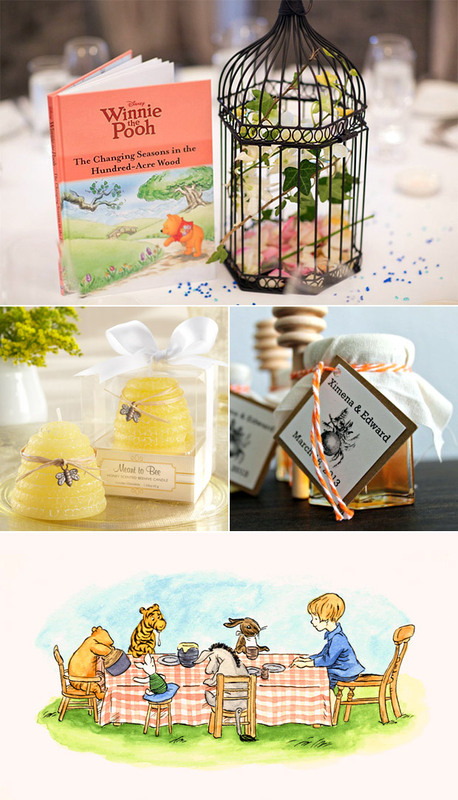 This is also really unique – you’re more likely to see Winnie at a baby shower than a wedding. 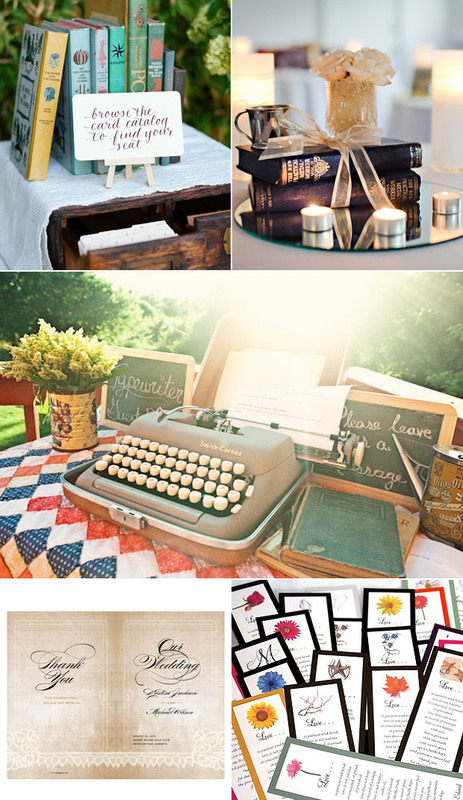 This is a serious contender for possibly the BEST book wedding theme of all. Check this out – it all starts with a ring. The story is all about staying together and persevering through dangers untold. The elven jewellery and fashions are to die for. You can go as far out as you want making it a full-on themed wedding to the last detail, or just stick to your choice of carefully selected accents, like jewellery for example, or goblets on tables. There’s no colour dilemma – think lush greens with silver accents for an absolutely stunning look. It’s a perfect summer or autumn theme, although will work all year round. Also, this book is perfect for some page art, and has been reprinted in so many editions, you’ll easily find a few tomes to take apart and use for your table décor – for example, fold pages lengthwise and tie with ribbon as napkin rings, or cut into long ribbons in three different sizes to make 3D hearts with nothing more than a stapler, in mere minutes. This is the perfect choice for a unique celebration – it lends itself perfectly to personalisation yet is rarely seen in the world of weddings, so you definitely won’t look like a trend-chaser. Absolute win-win. If you can’t pick a single book to focus on, pick them all! If you and your fiancé(e) love reading, nobody will be surprised to see stacks of books as centrepieces, and quills hidden among the flowers. A book theme works all year round, but lends itself particularly well in autumn and winter. When evenings are getting darker and there’s a chill in the air, you pull your favourite knitted sweater out of the wardrobe and relax with a good book and a cup of hot tea – or cocoa. There are marvellous DIY options here, and our favourite idea is origami flowers made from book pages, either at each place setting, as part of the table flowers, or as part of the bride’s bouquet. We also love those vintage typewriters accompanied by a stack of blank cards for guests to type their messages on. 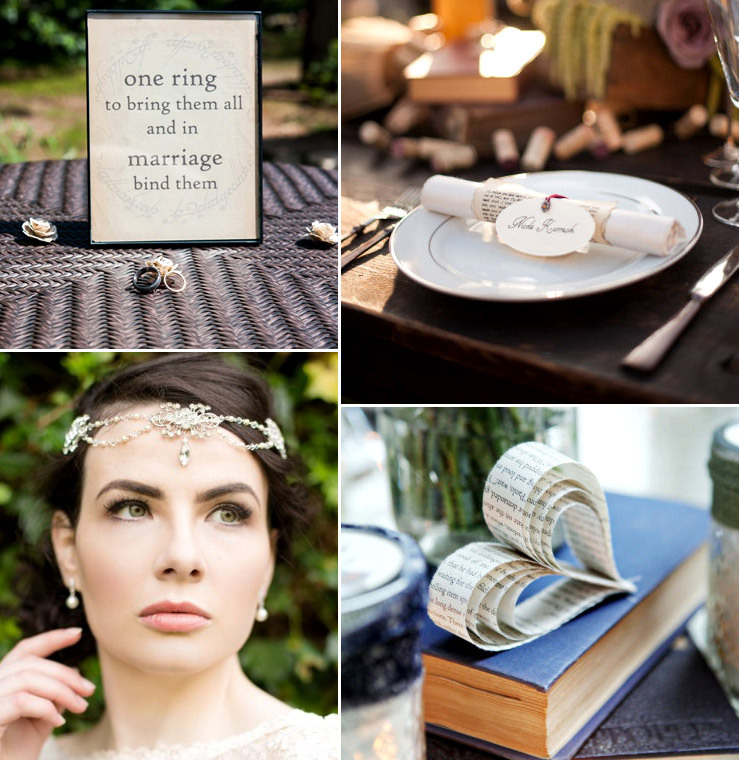 This theme is perfect for both a budget and no-budget bride – secondhand bookstores, charity shops and carboot sales are perfect for inexpensive books of all colours, shapes and sizes, while pricier brand new books or blank diaries make perfect favours. For even more ideas, check out this post on Buzzfeed! Beautiful collections guys, thanks for including our Lynette headpiece, fits in perfectly with the Lord of the Rings theme !